I must admit that I was late getting on the slow cooker band wagon, and honestly just never felt the need to invest in one. I was finally coaxed into giving it a try last year and haven’t looked back since. There are so many dishes I can now make in my slow cooker that I used to bake for hours in the oven. 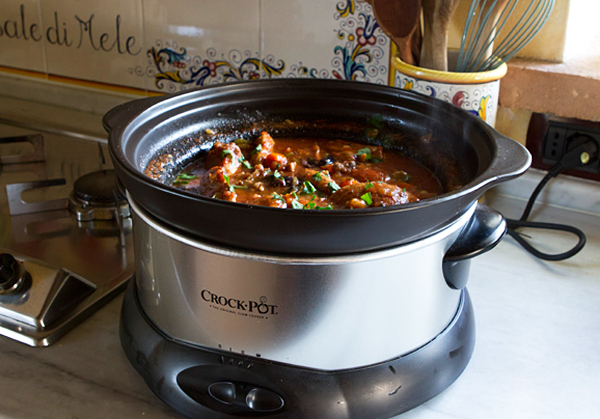 The slow cooker uses less electricity and does an remarkable job with every dish I’ve tried. My favorite recipes to adapt to a slow cooker have to be soups and stews as the extremely low temperature works remarkably well for both. 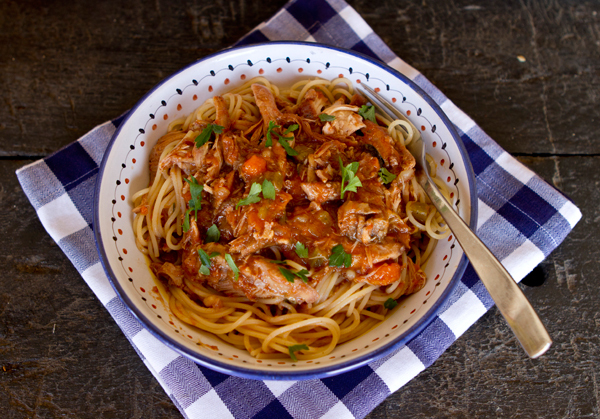 Recently I had planned on making a nice chicken cacciatore, but I wasn’t going to be home much of the day, so I decided to make it in my slow cooker. The stew turned out beautifully, and the chicken was so tender it fell off the bone. Since we had lots of leftovers the next day, I shredded the chicken and used the stew as a sauce for whole wheat pasta. Cacciatore means “hunter” in Italian, and when referring to Italian cuisine, alla cacciatora refers to a meal prepared “hunter-style” with tomatoes, onions, herbs, perhaps sweet peppers, and sometimes wine. 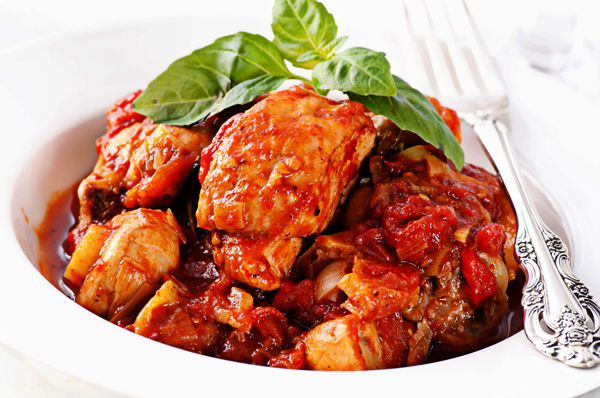 Cacciatore is most often made with braised chicken or rabbit. There are many different variations of this dish based upon ingredients available in specific regions. For example, in southern Italy, cacciatore often includes red wine, while in northern Italy, white wine may be used. You may substitute some mushrooms for the red peppers if you prefer, though I do like to brown the mushrooms first in the same pan I’ve used for the chicken before I put them in the slow cooker. I often serve this type of stew with a side of sautéed spinach or other greens, and either brown rice, whole grain pasta, or mashed potatoes. Remove the skin and trim any fat from each of the chicken pieces. Heat the oil in a large pan over medium heat, and brown the chicken pieces well on both sides, about 4 minutes per side. Remove the chicken pieces to the crock pot. Add the onions, peppers, garlic, and celery to the crock pot. Add the wine to the pan and cook over high heat scraping up the browned bits from the bottom until the wine has reduced by half. Pour the reduced wine into the crockpot along with the tomatoes, oregano, parsley, salt and pepper. When finished, remove lid and keep the crock pot on HIGH one hour to help it thicken.